Following the great sacrifice, King Dasaratha distributes the Pinda to his queens and all of them conceive. Kausalya gives birth to Rama. Kaikeyi becomes the mother of Bharatha. Sumatra, having received two portions of the Pinda, becomes the mother of twins – Lakshmana and Shatrugna. In Valmiki, Rama is often referred to as Dasarathi (Son of Dasaratha) while Lakshmana is known as Saumitri (Son of Sumatra). King Dasaratha is seated majestically in Virasana posture in a platform. He is in the process of distributing the Pinda to his queens. He is adorned with Makuta and Patra Kundalas. His posture is assertive; the anxiety and urge observed during the Sacrifice has given way to confidence and composure. Having achieved the desired outcome of the sacrifice, he is happily distributing the Pinda to his queens. The queens are seated on either sides of the King, sharing the same platform. The one seated to his left in an intimate posture, might represent Kaikeyi – his favorite. The one to his right receiving the Pinda could represent Kausalya. The overall composition of this panel is a shrewd representation of royal household with hidden subtleties. A Sage [Rishi] is seen hailing the event in Vismaya hasta – in the background. His posture suggests narration. In all probability, he might represent the Sutradaris of ancient Indian dramas. Sutradaris help to narrate the events of an unfolding drama through songs and dialogues [Vachika Abhinaya]. They propel the story by providing vital background information necessary to appreciate the events and sequences that are being enacted. It seems the artisans of Kumbakonam drew inspirations from contemporary dramas on Ramayana. A similar character (probably the very same Rishi) was seen earlier with another Sage (holding a music instrument) during the sacrifice. This Sutradari portrayal is peculiar to Kumbakonam and is not seen elsewhere in Chola Ramayana panels. A curious dwarf figure is seen in the left corner of the panel. He is in Anjali hasta [clasped hands] – prostrating the stage. 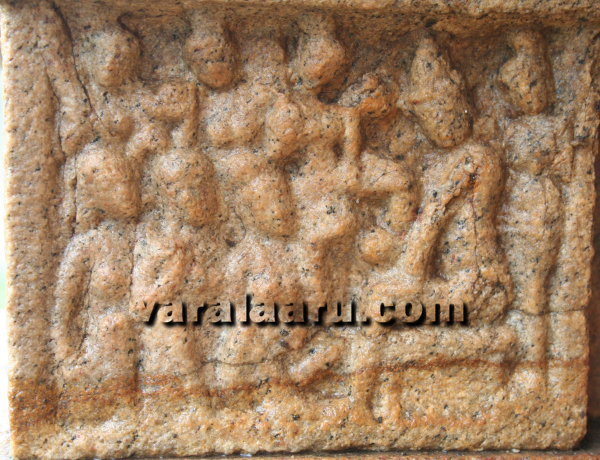 This figure does not represent the royal attendants, usually featured in Chola narratives. Attendants are not dwarfed to such small sizes – as seen from the next panel at Pullamangai; it probably represents a spectator witnessing the drama. The King is seated in a Chair on one side of the panel. His left hand rests in his thigh while the right hand carrying the Pinda, is in raised position. His overall posture is stiff, not at ease. Two attendants are seen on either side of the King. The objects they are holding in their hands cannot be identified. All three queens on seated on the floor, facing the King. Their faces are titled upwards. The first queen is receiving the Pinda with her raised left hand. Two maids are seen in the background, attending to the queens. Once again, the objects they are holding in their hands are unidentifiable. The location of this panel represents a royal household (Anthapura) – as suggested by the presence of many females with a single male (the King). At Kumbakonam there are six characters in the panel, in total. Four of them are the royals (the King and his Queens), one is a Sutradari and another is a spectator. At Pullamangai, the panel includes eight characters – four royals and four maids. Kumbakonam places the queens on either side of the King, sharing the same platform – suggesting a higher level of level of intimacy and relationship. The overall mood of the panel is that of joy and happiness and an enjoyment of celestial bliss received during the sacrifice. The theme at Pullamangai is in striking contrast to Kumbakonam. Even though the King is in his private household, he is not relaxed, as indicated by his stiff body. The queens are sitting on floor and are anxious to receive the Pinda – but they do not seem to be relaxed either. The overall mood is in low spirits as compared to Kumbakonam. The reasons for such a composition are worth pondering over. The artisans at Pullamangai probably wanted to emphasize the plight of Dasaratha and his inability to deliver issues on his own. So, they look at the event from the King’s perspective and present a theme that captures the mood of such a donation. While the Sutradari Rishi and the prostrating spectator elevate the Kumbakonam Panel to newer dimensions, the subtle feelings of the King suggested at Pullamangai scores on its own. These two panels, probably separated by no more than few decades atmost, provide a rare glimpse of the acute skill of Chola artisans in drawing inspirations from various contemporary sources and preserving them in stone for posterity. At Kumbakonam, the panel is divided into two vertical segments. Two royal characters are seated in each segment. One character is shown with folded legs – suggesting closeness with the King. The Sutradari is seen in the middle and is distributed between the two halves. 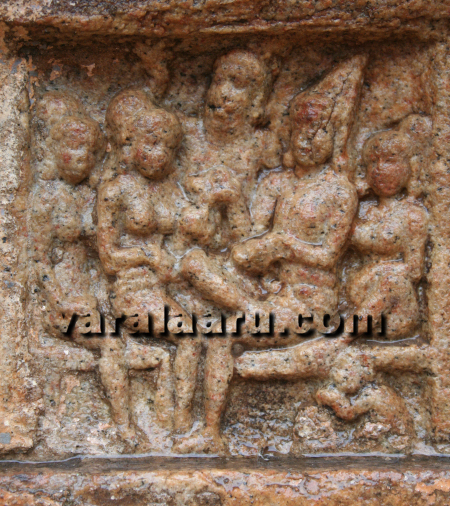 At Pullamangai, all three queens are shown on one side of the panel while the King is portrayed on the other side. The seated king and the standing attendants are balanced by the maids on the other side – just above the Queens.